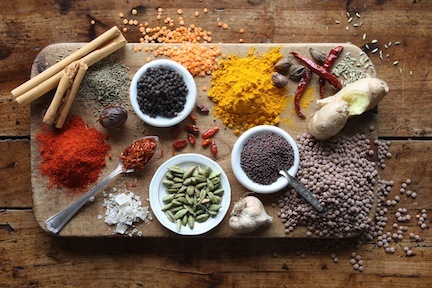 As well as being an expert catering company we also strive to become a top source for home-cooking tips, teaching our blog-readers a thing or two about Indian cookery. Thinking inline with this mission we made our way to the A1 Kitchen, picking our chefs’ brains and rummaging through their impeccably neat cupboards. Running their kitchen like an army the chefs of A1 Catering are endorsers of order, with their spice rack being a huge operational focus. ‘Herbs and spices are at the centre of all our dishes; having a huge impact on the attitude and presentation of the food we serve. For this reason our produce must be kept in order, not risking cross-contamination’ comments one chef. Chefs carry out regular spice checks to ensure all produce is fresh and packing the right punch, a practice they encourage customers to take home with them. With Indian food being all about the maturing of flavours dishes like curry and biryani need the right about of time to cook and flavour, hence why you will find many, many stopwatches dotted around the A1 kitchen. ‘Make sure you allow enough time for your curry to establish its tastes. Although the meat of vegetables may be cooked the curry may be hours away from perfection’. Believing that ‘there is nothing worse than cold curry’ the Indian food experts are extremely passionate about heat, wanting all of their dishes to be enjoyed at the temperature in which encourages the best food experience. ‘We recommend getting your food straight to the table’. With their wedding menus in constant revision the A1 cooking team like to introduce fresh ideas on a constant basis, putting on a unique, flavoursome production with every event they cater for. ‘When cooking at home get experimental, try new things! This is how we keep passion alive in our kitchen both in work and at home’. For more home-cooking tips be sure to stay up-to-date with the A1 Catering blog!